The former hedge fund boss Bill Browder has become the world’s highest profile campaigner against Russian corruption since the death of his lawyer Sergei Magnitsky in a Moscow jail cell. He has published a bestselling book on his experiences and successfully campaigned for a “Magnitsky Act” in Washington, listing and sanctioning officials claimed to have been linked to the death. He has been hailed for taking on some of Russia’s most dangerous and wealthy people, all in the name of human rights and justice. But now he has been dragged into a high stakes legal battle in the US in which a company which is fighting a US Government lawsuit has itself made allegations about his actions while doing business in Russia. The US Government has rejected the claims and says the accusations against him are “false” and “baseless”. Sources close to him dismiss the allegations as an outrageous smear campaign, coming as they do from a Russian linked property company desperately fighting allegations that it benefited from a giant fraud committed on Mr Browder’s Russian hedge fund Hermitage Capital Management. But they are doubtless unwelcome for the man who has become as famous for his human rights campaigning as for his former career as a successful hedge fund manager. His accuser, a company called Prevezon, is said by the US government to have benefited from the $230m (£152m) tax refund fraud in 2007 on Mr Browder’s Russian Hermitage fund. In a court filing, Prevezon has claimed Mr Browder himself could have conducted an elaborate scheme to help defraud his own company. This, it claims, would have enabled him to avoid arrest by the Russian authorities. The US government has rejected Prevezon’s claims against Mr Browder as “false” and “meritless” in its legal filings. Property owned by the Prevezon group in New York has been seized by the US Department of Justice (DOJ) in connection with the case. The US is seeking asset forfeiture and money laundering fines from Prevezon. A hearing is scheduled for 6 January. The latest filing from the Prevezon camp, one of 440 submitted by both sides in the case, also alleges that the DOJ “now tells a completely different story” in its case, allegedly in an attempt “to protect Browder from charges that he sold out Sergei Magnitsky” after Magnitsky was thrown in prison. The US government has said Mr Katsyv’s claims were “meritless and irrelevant factual contentions” and that the defendants “explicitly agree that a massive fraud was committed”. “The defendants spent the bulk of their motion arguing with aspects of it, including accusing the victims of the Russian frauds of being its perpetrators. These accusations are false and based on an incredibly selective and inaccurate presentation of the evidence,” the government said. Hermitage was at its peak Russia’s largest foreign investor. The fund was launched by Mr Browder and co-founder Edmond Safra in 1996, but relations with the Russian state turned sour in 2008, when Hermitage claimed it had $230m in tax rebates stolen through a complex fraud. The Russian authorities raided Hermitage’s offices in 2007 and Mr Browder’s firm said this laid the ground for a complex scheme allegedly to steal the money, which involved the forgery of documents obtained in the raid. Magnitsky, who was investigating the fraud claims, was subsequently arrested by Russian authorities but died in prison. The US government has since gone after individuals it believes benefited from the alleged fraud. The DOJ froze Mr Katsyv’s assets, after accusing his company of laundering some of the alleged proceeds. Challenges by Prevezon over the US’s complaint were dismissed twice by the district court in November 2014 and more recently in October 2015. The second circuit appeals court also dismissed the challenge in July 2015. The Swiss General Prosecutor has also launched a criminal money laundering investigation into the alleged $230m fraud. So far about $40m of assets have been frozen by authorities around the world looking into the case. Red Notice: Who is bill Browder? 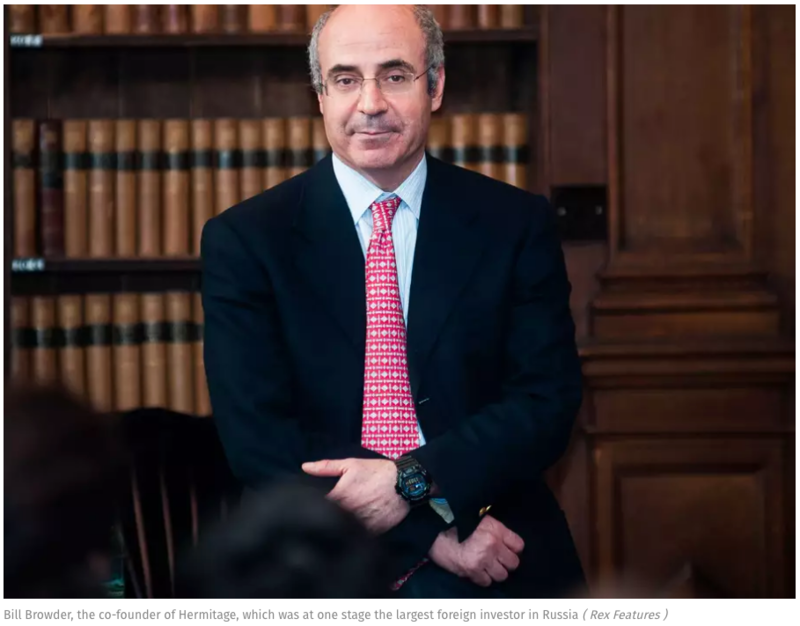 There aren’t many investors who have stepped out of the shadow of the Square Mile and changed the global justice system – but Bill Browder is one of them. His dogged pursuit of justice for Sergei Magnitsky, the lawyer and accountant who was found dead in a Russian prison, sparked an overhaul of human rights laws. Born in the US, Mr Browder, whose grandfather was once a US presidential candidate, spent most of his career working in London’s financial districts, joining Boston Consulting Group’s offices in Mayfair before stints at Robert Maxwell’s MCC conglomerate and the London outpost of US investment bank Salomon Brothers. But his discreet career was shattered by the collapse of Hermitage Capital, his $4bn Russian hedge fund, and the subsequent death of Magnitsky. Forced into the spotlight, his campaign for justice caught the world’s attention. Mr Browder went to Capitol Hill and won the support of leading senators such as John McCain and Joe Lieberman for. The Magnitsky Act, which was signed into law by President Obama in 2012, was hailed as a major breakthrough in human rights laws. Mr Browder has since published a well-received book, Red Notice, leading to a string of TV appearances including an appearance on The Daily Show with Jon Stewart. A human rights award has also been set up in honour of Magnitsky and Mr Browder has become a leading activist, appearing as a speaker at places such as the Oxford Union. The shockwaves from the Magnitsky Act are still being felt – and will mean Mr Browder stays in the limelight for some time to come.